Blue Jays fans received their sucker punch early this season. 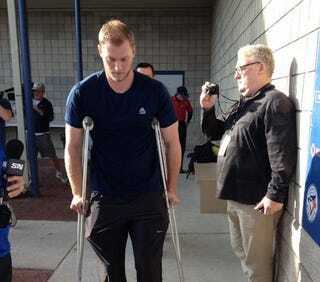 Outfielder Michael Saunders stepped on a sprinkler head in spring training, and now he needs surgery. He might be out until the All-Star break. [Saunders] was shagging balls Wednesday morning at the team's training complex when he jammed his foot on a sprinkler head indentation. Saunders said the pitch was a little wet at the time. "It was a tiny bit slippery, I just think I stepped in the wrong spot."